Students show their first-gen pride at UC Irvine, where half of all incoming students last fall were the first in their family to go to college. Check out UC's first-gen website for student stories, resources and more. Could something as simple as success coaching level the playing field for first-generation college students? A new program at UC San Diego that paired first-gen college students with peer and professional ‘success coaches’ boosted both grades and student satisfaction rates — becoming so successful that the campus is adding 400 participants in the coming year. The coaching program is one of a number of innovative approaches being tested across the University of California system to ensure academic success among the growing number of students who are first in their families to attend college. Over the last 15 years, the number of first-gen students at UC has almost doubled — from 48,000 in 2002 to more than 88,000 today. These college trailblazers now account for 42 percent of all undergraduates. At a UC conference this summer, more than 250 faculty, staff and educators met to share programs and best practices to help these newcomers adjust more quickly to academic life. At the top of the agenda: Helping first-gens obtain the same confidence and social connections — what academics deem ‘cultural capital’ — to smooth the transition to college. A student in the success coaching program meets with her peer adviser over lunch. Overall, first-generation students do well on UC campuses, graduating at the same high rates as their peers. They also do well after graduation, earning salaries that are similar to other alums — usually eclipsing the earnings of their families within five years of graduation. Yet the data also show room for improvement. First-generation students take longer to graduate, on average, and lag behind their classmates in grade point average, especially during their first few terms on campus. They are also less likely participate in a range of academic opportunities, from undergraduate research to study abroad, that could open new doors and make their undergraduate experience richer. One reason for the disparity, educators say, is that lack of cultural capital. By matching students with experienced peers, students make friends and have someone who can show them the ropes. UC San Diego tested the approach last year with a program that connected incoming first-students with student peer and staff advisers who acted as their success coaches. Coaches checked in by phone and text with tips — like where to find a study group or how to manage their time as midterms approached. They reminded them of upcoming registration deadlines and alerted them to academic opportunities, like a new study abroad scholarship developed just for program participants. The program used demographics and student data to identify and enroll students who were unlikely to seek out support services on their own. After two academic years, the program has proved so successful, that UC San Diego is increasing the number of participants from 800 to 1200. Students who actively participated in success coaching had higher grade point averages and fewer incidences of academic probation than students who did not connect with their success coaches. Even more striking: On the campus’s biannual Student Satisfaction Survey, participants reported higher levels of student satisfaction than students in other programs. Participants at a UC-wide conference this summer shared programs that are working to boost first-gen success. Some campuses have also begun reaching students literally where they live, offering facilities in which first-gen students room, study and attend some classes together. UCLA became the latest campus to embrace that approach, opening a dedicated first-gen residence hall in fall 2018. The hall’s 90 residents represent a wide range of cultural, economic and ethnic backgrounds, but they have quickly bonded by sharing experiences and working together to figure things out. “You walk on the floor, and there’s this incredible feeling of support and positive affirmation,” said La’Tonya Rease Miles, director of First Year Experience at UCLA. UC has also begun a first-of-its-kind effort to tap faculty who were themselves first in their family to go college and encourage them to identify themselves to students and share their personal stories. 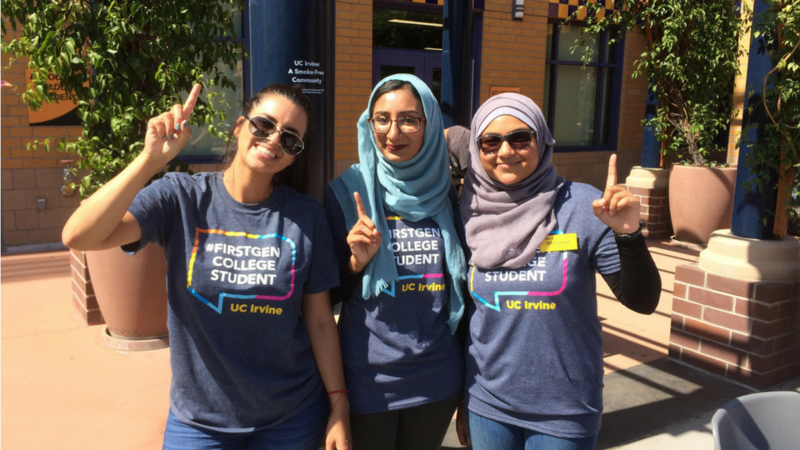 As classes began on UC campuses in fall of 2018, more than 900 faculty donned T-shirts and buttons for the first day of class that proclaimed themselves “first-gen college grads.” The aim: Humanize faculty in a way that would make students more likely to go to office hours, establish relationships and seek them out for advice. Participating faculty have established online directories that students can use to find allies, and they often participate in networking events and connect with students through formalized mentorship programs. At UC Merced — where 70 percent of students are first generation college students — incoming students with the Fiat Lux scholars program are invited to a fall dinner with roughly 100 first-generation faculty. The evening creates lasting connections, with participants often going on to work with faculty on projects and paid research fellowships. By connecting with faculty, students build connections that can help advance their academic career. While efforts like these are helping students get to know faculty, new tools for analyzing data are putting power in the hands of faculty to gain a better understanding of their pupils. At UC Irvine, instructors are using Compass, a new data analytics tool that offers an at-a-glance overview that provides demographic details for every class. While obscuring the identity of individual students, the report reveals information such as how many students are first-generation, how many have taken a prior course in the subject matter and how well those students did academically. It also links to research-based tips for addressing various audiences. The effort is just the start of a conversation about how to communicate with various groups of students. But it is part of what many educators say is a growing effort to rethink academic practices and assumptions in light of a changing student body.